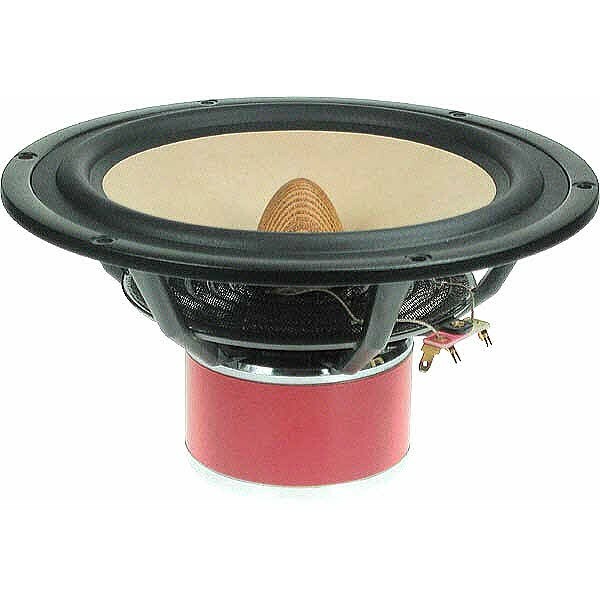 SEAS Exotic X2-08 W8 8 Ohms 8" woofer-midrange , £382.50 Excl. VAT. Smooth response, high sensitivity, low distortion. The SEAS Exotic X2-08 F8 is an 8 Ohm 8" woofer-midrange designed for smooth, wide frequency response, high sensitivity, and low distortion. The special paper cone is embedded with papyrus fibres to optimize stiffness and damping. A special foam rubber surround reduces mass by 40% compared with conventional rubber surrounds, resulting in higher sensitivity and excellent damping properties. A new proprietary spider design dramatically improves the performance of this critical suspension part, combining an extremely open weave with a new resin formulation, resulting in all noises normally created by the friction of the threads rubbing together being virtually eliminated. Additionally, the open weave is highly acoustically transparent, minimizing the reflections and resonances associated with conventional spider designs. A high temperature copper voice coil is wound on a rigid, non-conductive glass fibre former. The Alnico V ring magnet system gives high sensitivity, excellent stability, and low distortion. A copper cap on the pole piece, combined with an under hung voice coil reduces nonlinear distortion to a minimum. New H2 lead-out wires eliminate noise due to roping and resonances. A stiff and stable injection moulded zinc basket keeps the critical components in perfect alignment. Generous windows both above and below the spider reduce reflection, air flow noise and cavity resonances to a minimum.